Murder by Gaslight: Murders in Maine. 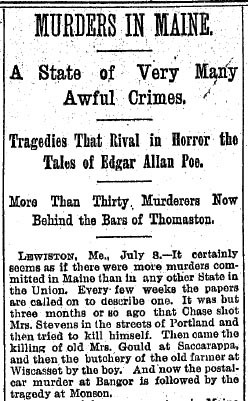 This article on murders in the State of Maine appeared in The Boston Daily Globe on July 9, 1888. It was quite long, so I edited out six or seven gruesome Maine murders, leaving only the two stories that the author compares to those of Poe and De Quincey. I may post the rest at a later date. A State of Very Many Awful Crimes. Tragedies That Rival in Horror the Tales of Edgar Allen Poe. More than Thirty Murderers Now Behind the Bars of Thomaston. 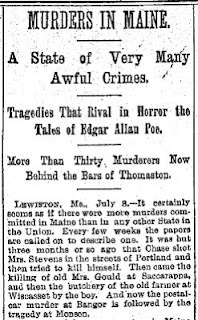 Lewiston, Me., July 8.—It certainly seems as if there were more murders committed in Maine than in any other State in the Union. Every few weeks the papers are called on to describe one. It was but three months or so ago that Chase shot Mrs. Stevens in the streets of Portland and then tried to kill himself. Then came the killing of old Mrs. Gould at Saccarappa, and then the butchery of the old farmer at Wiscasset by the boy. And now the postal-car murder at Bangor is followed by the tragedy at Monson. The story of the many murders in Maine in the past 20 years is a most peculiar one. It is especially peculiar in this respect—that out of the scores of tragedies hardly one has been the result of drink. In some few instances the murderers have been drinking men, but they were sober when the crime was committed. Another peculiar feature of the story of capital crime in Maine is that almost every murder is marked by some striking and novel feature, something unusual in the motive or in the manner of the crime. Edgar Allan Poe could not have told a more gruesome story than that of the Watson murder in the town of Parkman, and De Quincey, before writing his famous essay on “Murder as a Fine Art,” might have talked with profit to the never-to-be-detected assassin of Tax Collector Elliot of Glenburn. There has been one murder in this State in the last 10 years in which the assassin, though seen by one man, vanished so completely that never has the slightest trace as to his identity been found. This is the murder of Tax Collector Elliot of Glenburn. About 9 o’clock on a clear winter night in February of 1879, Night Watchman Colson at the Maine Central station in Bangor saw a two horse sled coming rapidly down the street. The night was so intensely cold that the sled runners screamed on the snow, yet the horses were steaming with perspiration and covered with lather. The driver, who had his cap well pulled down over his eyes, dashed up the side of the platform, and throwing the reins across the horses back leaped off and rather sharply asked Colson to look out for his team while he went into the station. The through train came along in a few minutes and as the stranger did not reappear, Mr. Colson thought that he would blanket the steaming horses. The blanket and two or three bags of grain lay in the shed. As he pulled the blanket off, there fell from it a bloody axe, and then he was horrified to see that not only the blanket but the grain bags were spattered with blood. There was a human hair on the pole of the axe. He had hardly notified the police when intelligence was brought in that the dead body of a man had been found in the snow at the roadside a little way out of the town. The body was at once recognized as that of William B. Elliott of Glenburn, the town constable and collector of taxes. The head had been split open, then beaten in by the pole of the ax and finally pashed flat by blows struck with the side of the same deadly weapon. Two or three persons were suspected but there was really no proof against them. The murderer was seen by Watchman Colson. He has never been seen since and never, probably, until the judgment day will his awful crime be punished. Not even “The Murders of the Rue Morgue” or “The Mystery of Marie Roget” rival in tragic horror the slaying of Alvin Watson in the town of Parkman. Alvin Watson was a sturdy farmer, who was unmarried and lived alone. One morning in June, 1881, he was found dead in his own dooryard with gaping knife wounds in all parts of his body. From the appearance of his bed it was evident that he had been attacked in his sleep. The kitchen adjoining his bedroom was in the utmost confusion There were pools of blood on the floor, and everywhere signs of a most violent struggle. One window was up, and its ledge was drenched with blood. There was a trail of blood from the kitchen to a point in the dooryard, some 40 feet away. Here the body was found, and it had evidently been dragged there by the heels. Suspicion fell upon young Samuel B. Chadborne, the son of a neighbor. Chadborne was a deaf mute, and not knowing the deaf and dumb alphabet could communicate only by signs. No one pretended to be able to understand him at all except his family. When he was arrested bloody stains were found on his clothing, a bloody knife, said to be his, was found in the house, and his vest was found at Watson’s house. His neck was scratched and the skin was abraded. Strange to say his father, Benjamin Chadborne, and his brother Wallace Chadborne, were the first to call attention to his probable guilt. This continued so pertinaciously that some began to think that perhaps they too, had a hand in it. Inquiry developed sufficient circumstantial evidence to warrant their arrest and indictment. And now the real drama began. It happened that there was an old farmer in the Chadborne neighborhood who was sufficiently acquainted with the deaf mute to understand somewhat his signs, and through him the court learned the story of that awful night. By his gestures the boy indicated that his father, his brother and himself had agreed to kill Watson. In pantomime he stole to the bedroom and struck at Watson; then Watson’s fingers circled his throat and threw him, half strangled against the wall. With waving arms and guttural sounds he indicated the frightened Watson standing in the dim light made by the dying embers of the open fireplace; the stealthy crouching approach of his father, knife in hand, behind Watson; the sinking of the knife into the victim’s back; staggering to the window, which he grew up, only to receive Wallace’s knife in his throat; and then the long continued stabbing of the dead body. Never were men convicted and sentenced to life imprisonment on testimony more dramatic. The deaf mute himself was sent to an institution for the deaf and dumb somewhere near Boston, but was accidentally drowned after he had been there a short time. These are but a few of the tragedies of Maine. At the present time there are more than 30 condemned murderers within the walls of Thomaston. Capital punishment has again been abolished in the State, but whether the punishment be death or life imprisonment seems in no way to affect the number of awful crimes.